the first to be seen for three years. Why not try to capture this precious “moment” using the sophisticated PROMINAR lens? Telephoto Lens/Scope 500mm F5.6 FL/TX-10 (500mm F5.6) + Canon EOS 20Da: ISO100 4sec. Lunar eclipses occur when the sun, earth and moon directly line up so that the shadow of the sun’s rays cast by the earth passes across the moon. Among the types of eclipses, the particular case where the moon passes completely into the earth’s shadow is known as a “total lunar eclipse”. 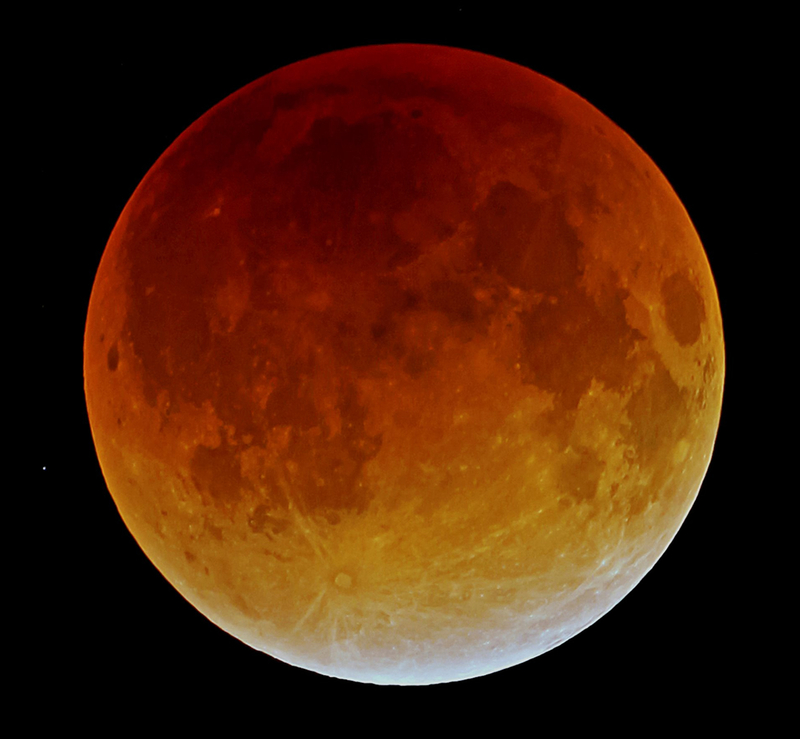 During a total lunar eclipse, the moon becomes dark, changing to a unique reddish tinged hue. Although the total lunar eclipse itself can also be viewed from urban areas, if you can watch the eclipse from a location in the fields or mountains, the sight of this red moon superimposed against a background of the star-filled heavens will be a truly fantastic spectacle. Telephoto Lens/Scope 500mm F5.6 FL/TX-10 (500mm F5.6) + Canon EOS 20Da: ISO100 1/250 ～4sec. using the PROMINAR 500mm F5.6 FL! The moon is unexpectedly small. Although we are not normally aware of it, the size of the moon that we see in the sky is unexpectedly small. In fact, if you pinch a five-yen coin between your fingers and hold your arm outstretched, you will be able to see the moon completely framed inside the hole in the center of the coin. So if you wish to capture images of the moon at a size large enough to fill the screen, this will require a focal distance that converts to an unbelievable 2000mm. Increase the size by trimming. Here I should point out that the PROMINAR 500mm F5.6 FL has a focal length of 500mm, which is considerably shorter than the required length. However, this is no problem. When this lens is used in combination with APS-C sized cameras, the converted focal length will become approximately 750mm, and combining with micro four-thirds cameras will realize approximately 1000mm. Then simply by trimming the images slightly it will be possible to capture images of the moon that have sufficient impact. 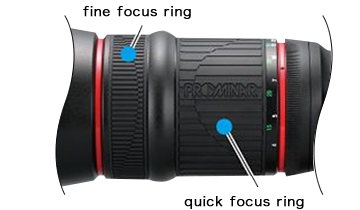 Further, by using the optional mount adapter TX-17, which multiplies the focal length by 1.7 times, the PROMINAR 500mm F5.6 FL focal length will become 850mm. Because this will allow the moon to be captured at an even larger size, I highly recommend this accessory for people who wish to try photographing the eclipse at even higher resolutions. If possible, mount the lens on an equatorial mount. When using the PROMINAR 500mm F5.6 FL for super-telephotography, you should use a sturdy tripod that will not shake even when the camera is moved or when there is a wind blowing. Additionally, the movement due to the diurnal rotation of the heavens is much faster than one would expect, and cannot be lightly disregarded. Therefore, if at all possible, I would recommend that the lens should be mounted on a stable equatorial mount so that images are captured while the lens is automatically tracking the moon. This is because the moon is very dark during an eclipse, requiring an exposure time of 1-2 seconds even at a high sensitivity of ISO 400, so the equatorial mount will also be effective for preventing subject blurring. Be sure to focus precisely. Focusing is extremely important when taking all photographs, not just when capturing total lunar eclipses. Using the camera’s live view function, you should focus precisely at enlargement rates of 10 or more times. The PROMINAR 500mm F5.6 FL employs a dual focusing system, and it will be best to use the fine focus ring to carry out fine focusing. Eclipses can also be greatly enjoyed visually. Total lunar eclipses are not only interesting to photograph, but are also enjoyable to watch. 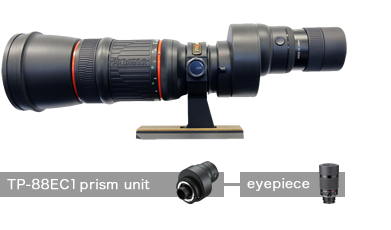 The TP-88EC1 prism unit and eyepiece options are available for the PROMINAR 500mm F5.6 FL. 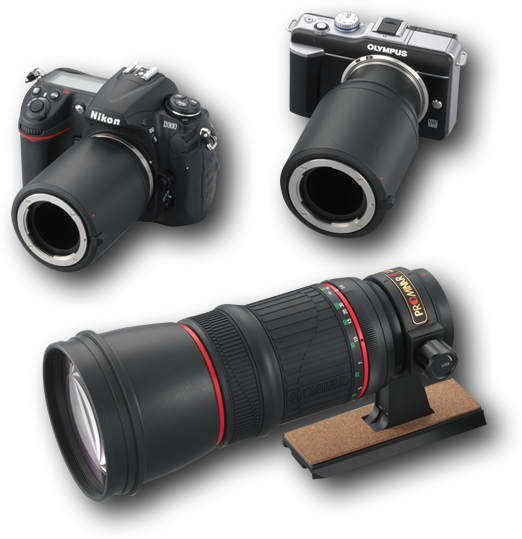 Using these optional accessories, it is possible to switch from photographing to the viewing of an upright image in a single movement. Even if you go to the trouble of preparing in painstaking detail, there’s always the chance that it will be cloudy at the time of the eclipse. Unfortunately, this is an ever-present risk in the case of astronomical phenomena where you have to rely on the vagaries of nature, and astronomy enthusiasts will no doubt have endured this bitter experience many times. However, this only makes it even more of a delight when the weather is fine and the eclipse can be viewed. Even supposing that January 31 is cloudy, it is worth remembering that the year’s second total lunar eclipse will occur early in the morning on July 28, although the conditions will not be so favorable. In addition to the sharp optical system using fluorite crystal lenses and the TX-17 mount adaptor which enables the focal length to be enlarged by 1.7 times, the TX-07 mount adapter is also available which allows the focal length to be reduced by 0.7 times to 350mm. These enable support for a variety of images and visual observations. Even after the total lunar eclipse has finished, this lens will undoubtedly prove to be highly useful in your photography. Japan’s representative astronomical photographer and weak light imaging equipment engineer. Representative Director of Nakanishi Image Lab., Inc.
Akio Nakanishi was born in 1964, the year of the Tokyo Olympics, and was brought up in Tokyo’s Itabashi Ward, an area of known for its optics and printing industries. He first became interested in space in his fifth year at primary school, and began taking astronomical photographs from his first year at junior high school. While studying at university, he worked for three years as an assistant to a commercial photographer. In addition to taking photographs of star-filled skies and urban scenes set against starry backgrounds using digital cameras, he specializes in capturing deep sky images using cooled CCD cameras. Among the many books that he has published are “Ways to take Photographs of Stars using Digital Cameras” and “Visual Guide to The Messier Objects & New General Catalogue Objects” (both Seibundo Shinkosha Publishing Co., Ltd.). His other books include “Techniques for Photographing Star-filled Skies in Urban Areas” and “Techniques for Photographing Starry Scenes” (both AstroArts Inc.). He has also jointly published titles including “Science of the Moon”, “Science of the Sun” and “Science of the Starry Skies” (Coauthored, all Junposha Co., Ltd.). As a guidebook of the total lunar eclipse, at the risk of flattering myself somewhat I would like to introduce my book which is called “Eclipse”. In order that the contents can be sufficiently understood even by children in the later years of primary school, I have included many illustrations and simplified the explanations, so I hope you will take a look. A rough exposure table for use when taking photographs is also included.